One of the most impressive aspects of the Tropical Rainforests is the incredible array of sounds produced by animals. Interior forest animals, from invertebrates to large mammals, rely on sounds to communicate; the forest is so dense that visual cues are meaningless. I enjoy rainforest animal sounds and like to pay attention to what is making this or that sound. Over the years and after many visits, I have become familiar with rainforest birds and mammals sounds. One of my highlight stories was my first experience with the sounds of a Rufescent Tiger-Heron. During my first few knights in the rainforest of eastern Peru, I knew nothing about animal vocalizations. Needless to say the sounds of the night were overwhelming. Lots of insects vocalizing at a time was one cool experience. Insects sounds taper off after a few hours letting owls, nightjars, pygmy-owls and potoos finally be clearly heard. It was past midnight when the forest gets rather quite when I started to hear monkeys near my tent pinched by an oxbow lake. But monkeys are diurnal except for Owl-monkeys that make only chip and shrill calls. I concluded the bizarre intermittent calls I heard for over an hour was some type of mammal. It was strange though that the calls would come from one point. I thought the mammal I was hearing was sitting in one place. I was so convinced that what I heard was some type of mammal. The next morning I was curious to know what was calling near my tent so I asked and mimicked the calls to those willing to listen. My poor rendition of the calls did not allow for a reasonable approximation. A tyra or a kinkajou were subbested, as well as possibly an owl. It was months later while listening to “Cassettes” of rainforest birds that I found what I heard that night. To my surprise, the bizarre sounds were made by a Rufescent Tiger-Heron!!! 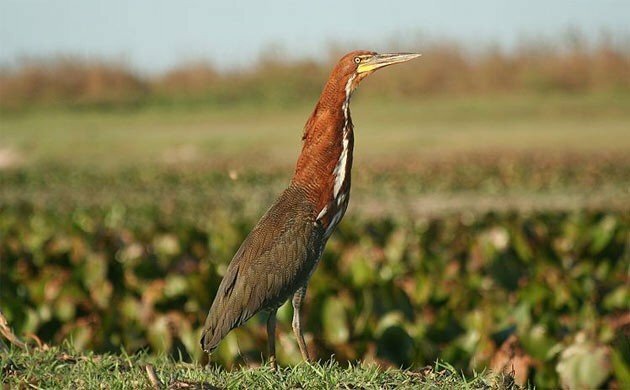 Listen to the sounds of a Rufescent Tiger Heron: Recording are stored on www.xeno-canto.org. It looks like the final “/” needs to be removed from the links in order for them to work properly. Thanks Michael. I just fixed the links.